A few weeks ago, I broke a HUGE new shoe rule. I wore brand new, never worn, never broken in shoes to a wedding. I love shoes especially heels, I own lots of them, and pretty much every pair of heels I own has needed a breaking in period. Sometimes one wear, sometimes 10 wears, but at least some breaking in before you plan to wear them to an event filled with dancing, standing, and walking around. Y’all these block heel sandals needed ZERO breaking in. These sandals were a Christmas gift, and I just never got around to breaking them in because well it was winter. I knew they would be the perfect shoe to pair with my long black dress for a wedding, so I decided to risk it and wear them straight out of the box. I spent cocktail hour standing and sipping champagne and followed it up with hours on the dance floor, all in no pain! At the end of the night, I saw so many women kicking off their heels to keep dancing, and I realized my feet didn’t hurt at all. It was at that moment, these block heel sandals made their way to the top of my list of most comfortable heels in my closet. I’m currently waiting for the taupe version to come back in stock in my size because that color will be perfect for spring and summer! One thing I love about block heel sandals is how they can work with both formal, dressy outfits and super casual outfits. They remind me of a dressier option to a wedge sandal. 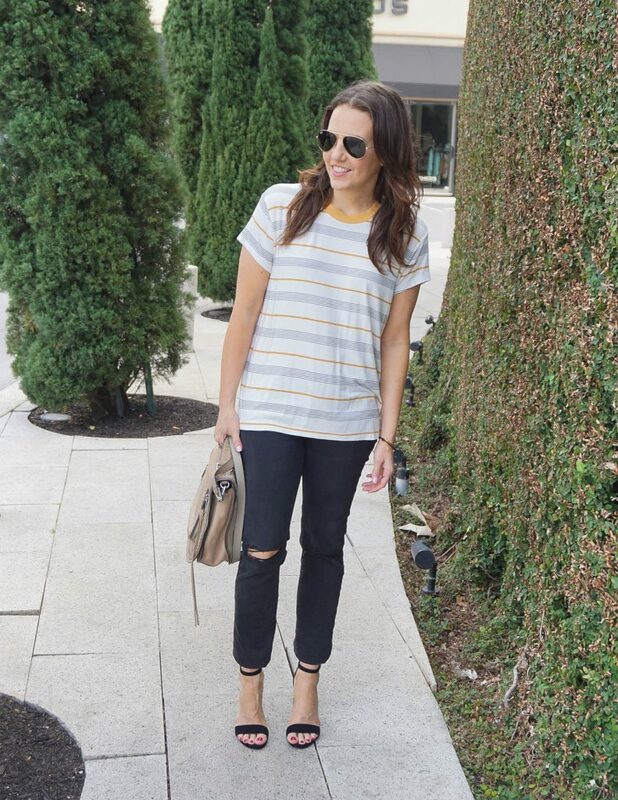 I could not resist styling them in this super casual tee and jeans outfit for today. 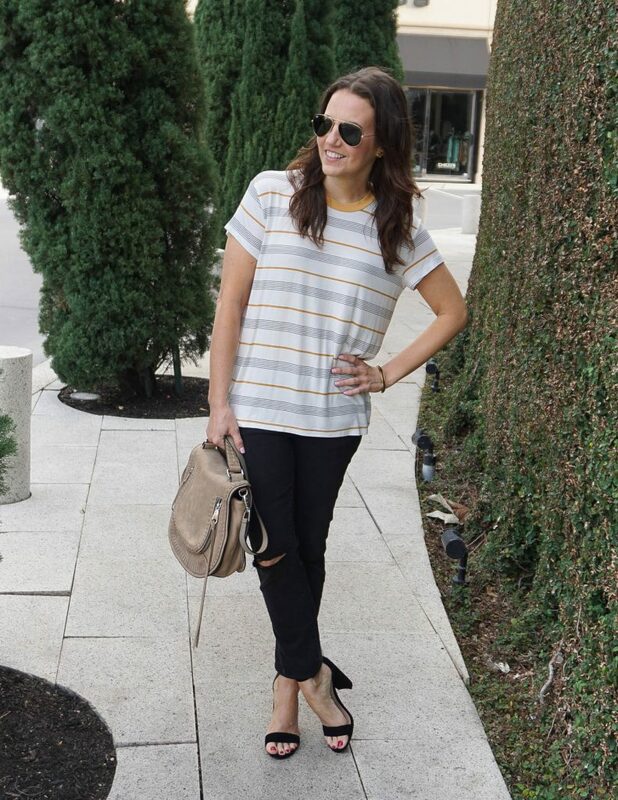 I love the pairing of the tomboy tee and the girly heels. Also you guys, this tee is sooooo soft!!! It will get lots of wears this summer for sure. 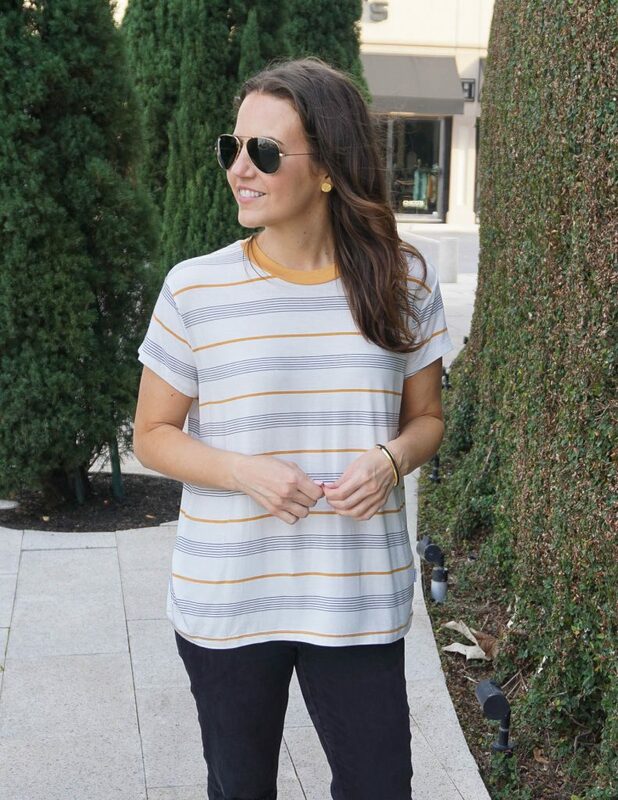 Don’t forget to check out today’s Style Link Up and thank you for stopping by! Blush pink and gray ranks high on my list of perfect Spring color combos. The two colors compliment each other so well. 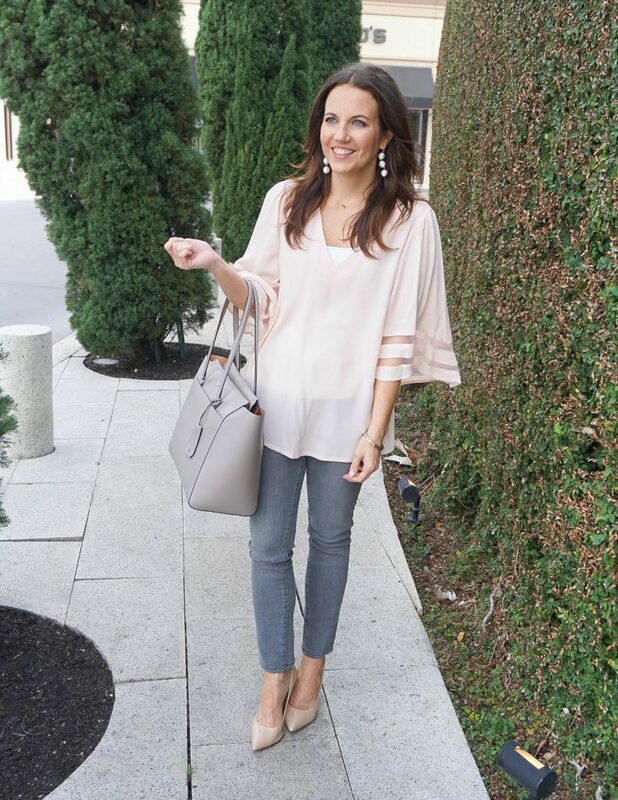 This blush pink top would look gorgeous with white or blue jeans, but I love the contrast with the gray. 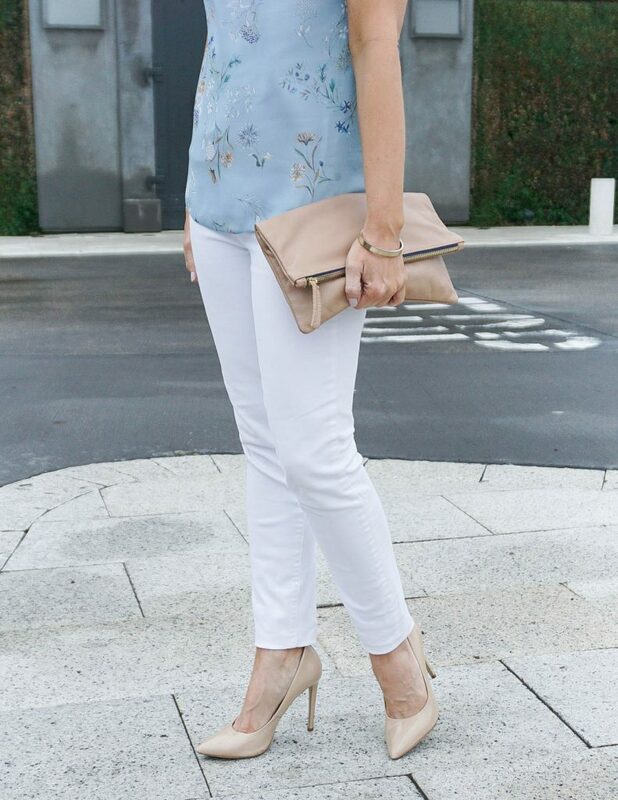 The feminine touches on this top make it so gorgeous and stand out. 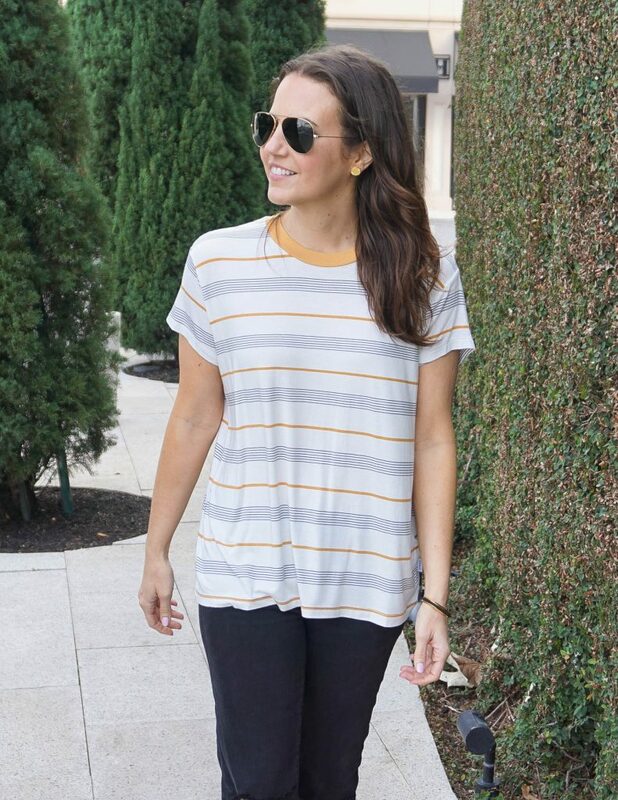 I love the big 3/4 length sleeve to help create effortless movement. 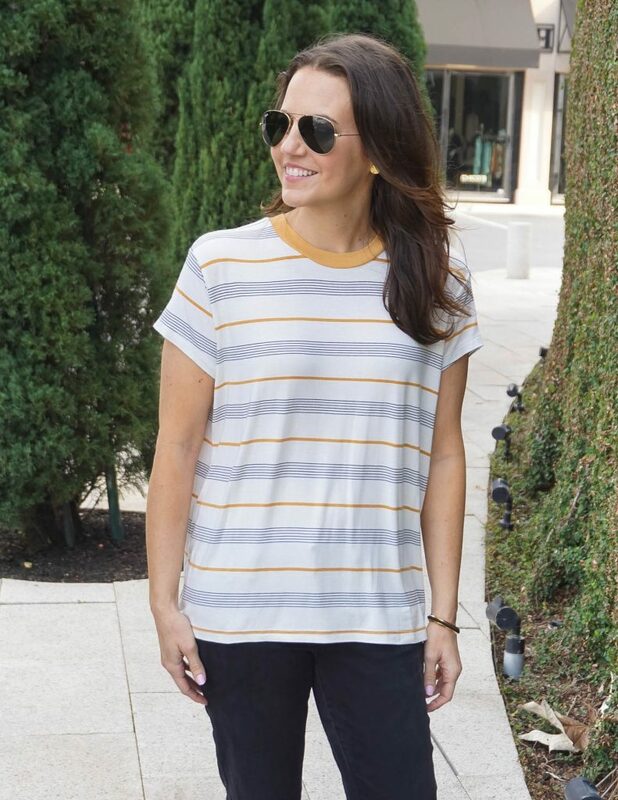 The stripe illusion design on the sleeve is just another beautiful detail on this top to help it stand out a bit from the rest of the blush pink pack. I kept the rest of my outfit pretty neutral with these cute white earrings and a rose gold necklace. I like that they compliment the top and do not overly distract from it. The top is semi-sheer, and a camisole is needed underneath it. I hope you guys have a fun weekend ahead! Today is Go Texan Day in Houston, so lots of cowboys boots, denim, and horses on the freeways. It’s the kickoff day to our rodeo which lasts for the next few weeks. I’ve talked about it in past posts with outfit inspiration here. It’s always a fun time in Houston. Thanks for stopping by you guys! I always appreciate the visit and your sweet comments!! Hello! Hello! How was your weekend?? The wedding I attended was amazing! I had so much fun dancing the night away. The dress I rented was absolute perfection. I was so sad to send it back yesterday. I did manage to squeeze in a blog shoot with it, so look for that in the coming weeks. You can see a little preview from my Instagram HERE. Also, I did a little sale shopping over the weekend and wrote a little post sharing my top picks for the Nordstrom Winter Sale. Be sure and check it out HERE for some discounted boots, coats, sweaters, and more! Now onto this outfit and all the Spring feels from it! We are flirting with 80 degree weather, and I love that it’s starting to feel like Spring, well minus the humidity part. 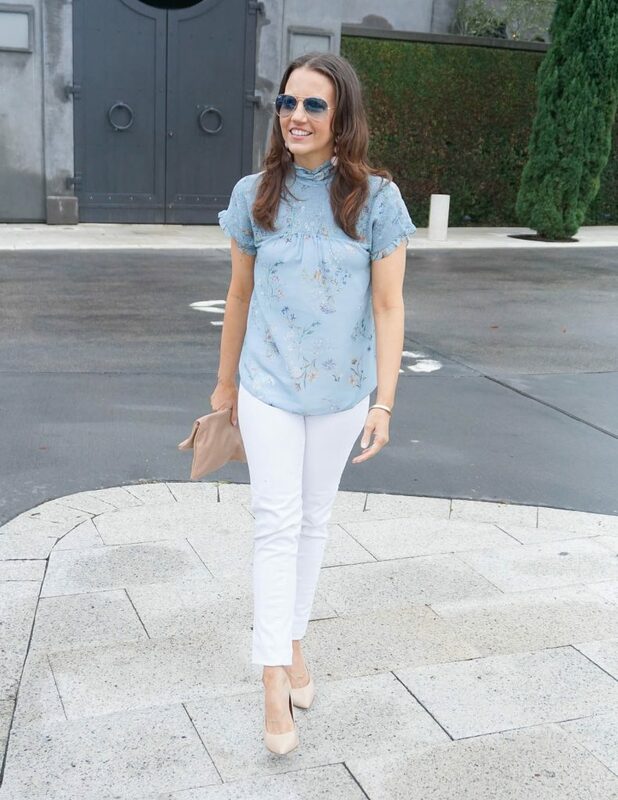 😉 I think this blue floral blouse would be so perfect to wear on Easter. 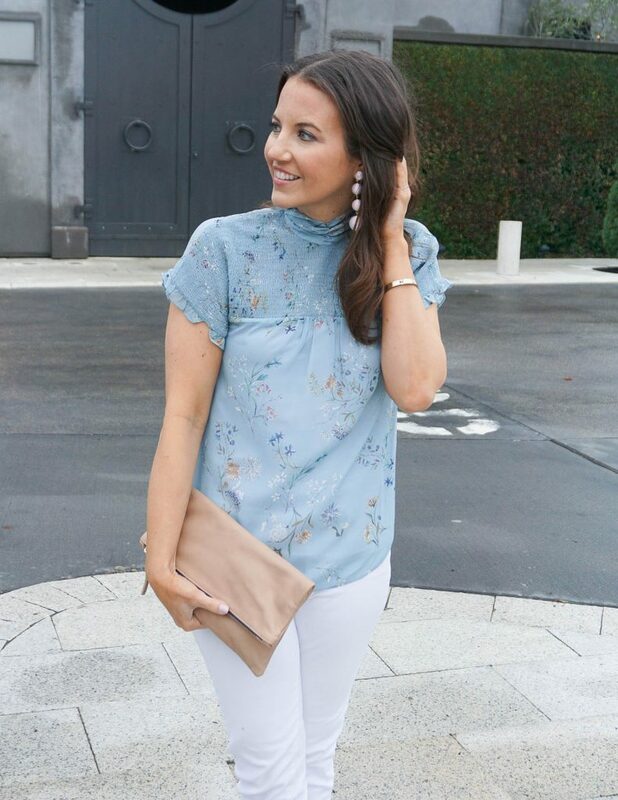 The gorgeous pastel blue, the subtle floral design, and beautiful neckline details make this top so perfect for a dressy casual Spring outfit. 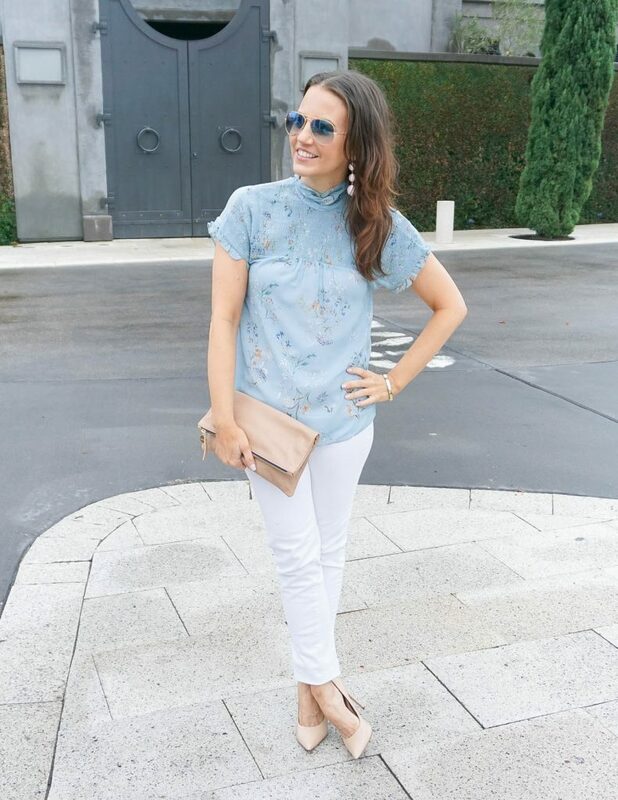 I love the lighter blue paired with white jeans. White is the perfect compliment to really let the pastel blue shine. I also added in my pink earrings to help bring out the warmer colors of the floral design on the top. 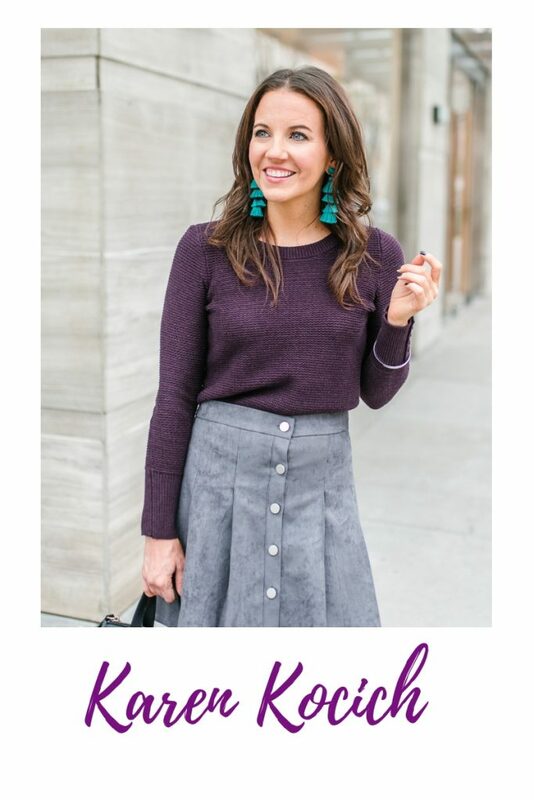 Y’all have a good week and don’t forget to check out the Style File Link Up at the bottom of today’s post! Thanks for reading! Happy Weekend! 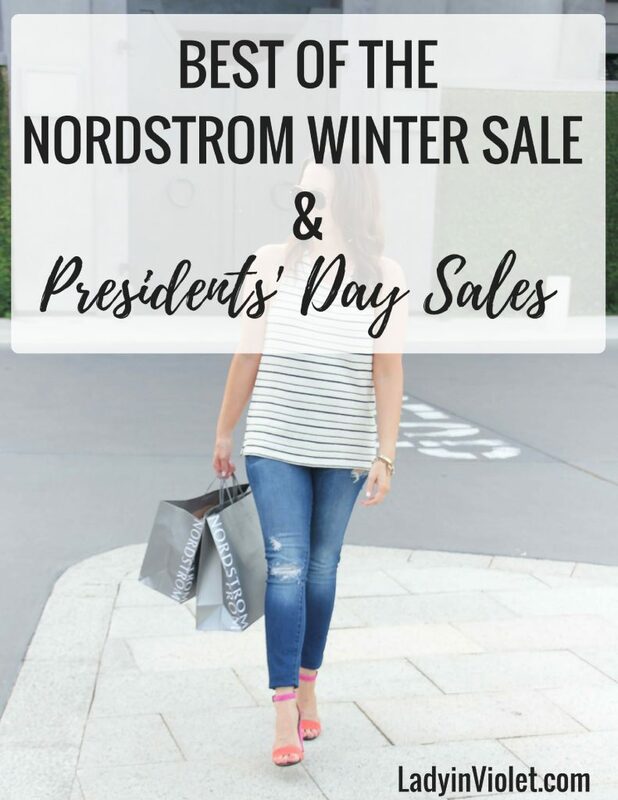 I had to pop in and share that the Nordstrom Winter Sale just started a few days ago with items up to 40% off! Winter items like boots, coats, and sweaters are typically more expensive, so this end of season sale is the perfect time to stock up on some of those cold weather essentials. I checked out the sale yesterday and shared some of my top finds below. I broke them down by category for you, in case you are looking for something specific this sale weekend. The sale runs for another week, but as some of you may know Nordstrom sale items usually sell out fast. Also, don’t forget to check out the end of this post for some of my top Presidents’ Day Sales worth checking out this weekend. Many of them include additional discounts on sale items, so even more places to shop for those winter essentials! I hope ya’ll are having a great weekend. Thanks for taking some time to stop by today!